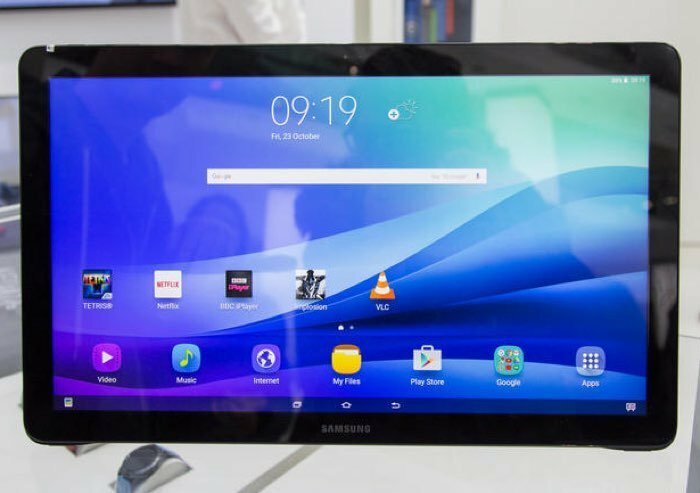 Samsung recently launched their new Samsung Galaxy View tablet, when the device was launched it retailed for $599.99, the device has only been available for about a month. Samsung has now reduced the price of the tablet in the US by $100 and it is now available from a number of retailers for $499.99. The tablet comes with a massive 18.4 inch display that has a Full HD resolution of 1920x 1080 pixels and the device is powered by an octa core processor clocked at 1.6GHz and it also comes with 2GB of RAM. The device features either 32GB or 64GB of built in storage, there is also a microSD card slot for extra storage and it comes with a 5700 mAh battery and a 2.1 megapixel front facing camera. There are no details as yet on whether this is a permanent price drop, you can find more details about the tablet at the links below, it is now available from a range of retailers in the US at the new lower price. The Samsung Galaxy View is available from Samsung, Amazon, Best Buy and more retailers for the lower price of $499.99.